I grew up in Winnipeg, Manitoba. The prairie is part of my blood and keeps emerging in my art-making – even though I have now lived on the Pacific Coast of Canada for the better part of my life. After I left, I went back to the prairie only rarely, and sometimes reluctantly, but now the arts have me going back more frequently. 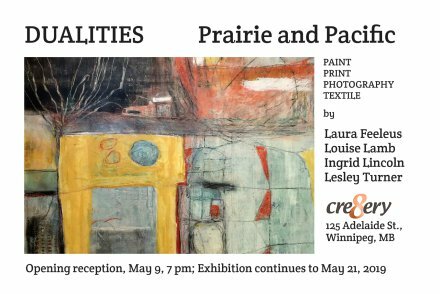 I will be traveling to Winnipeg, Manitoba in May for the opening of an exhibition at the Cre8ery at 125 Adelaide Street. It’s called Dualities and will feature work in paint, print, photography, and textile by four artists – myself, Louise Lamb, Ingrid Lincoln and Lesley Turner. Two of us live on the Coast, and two of us live in Winnipeg. The show promises to showcase our differences and our common grounds. I’ll be documenting my road trip to Winnipeg on Facebook (laurafeeleusart) and Instagram (foxglove66).